OliveSign is a new iOS app from OlivePhone Technology. It’s available now as a free download from the App Store with additional in-app purchases to upgrade functionality, and is currently featured in the New and Noteworthy section of the store’s Productivity category. OliveSign is an app that allows users to import various types of documents, turn them into PDF files and sign them. The signed document can then be sent on to someone else in its PDF format via email, or simply stored within the app for future reference. Importing documents to OliveSign is done via Wi-Fi. Activating the app’s File Transfer mode causes the app to temporarily act as a file server. Other devices can then connect to the iPhone’s local IP address in order to copy files straight into the app, and then File Transfer mode deactivated for security. There is no apparent other means of transferring files into the app, so if the user is not connected to a private, secure Wi-Fi network they will be unable to import documents. Tapping on a transferred document on the app’s main screen converts it into a PDF file — even if it has already been converted — and it then becomes available in a dedicated PDF section of the app. Tapping on a PDF file then allows it to be viewed full-screen. 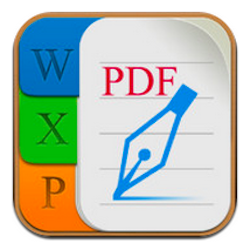 The PDF viewer allows pinch-to-zoom functionality, but does not allow navigation through swipes, instead making use of on-screen buttons to navigate forward or back by a page. Tapping the special “Sign” button in the corner of the screen allows for the document to be signed freehand using the touchscreen. The signature can be drawn anywhere on the page and then moved freely into position afterwards, but not resized. Once this is done, the document can be saved with the signature attached, and then sent to a recipient via email. OliveSign is a simple app that initially appears to perform its stated function competently, but it needs some work. The fact that it re-converts documents to PDF files every time they are tapped on is not particularly helpful, especially as the free version of the app limits the number of functions that can be performed per day. The limitations can be removed via in-app purchase, but there is no on-screen indication of how many conversions or signings the user has available at any one time. A more serious issue is the fact that the app is somewhat prone to crashing. When experimenting with the sample documents provided with the app, attempting to save a signed PDF file based on a Word 2007 file crashed every time, while a PDF based on a .docx file worked perfectly. Documents that caused the app to crash during saving become corrupted and impossible to view, meaning that the file must then be re-converted and re-signed. This is an issue which urgently needs resolving if the app is to be a practical solution either for PDF conversion or digitally signing documents. With this frequent crashing issue in mind, it’s impossible to recommend OliveSign in its current form. There is potential for a useful app here, but its unreliability negates any usefulness it presently has. Future updates should also look at making the interface a little more intuitive, too — swipe-based navigation of PDF files would be helpful, for example, as would indicators showing how many free uses the app has remaining for the current day. For now, then, OliveSign has the potential to be a good app, but that potential is presently unrealized. You can follow OliveSign’s progress with AppData, our tracking service for mobile and social apps and developers.